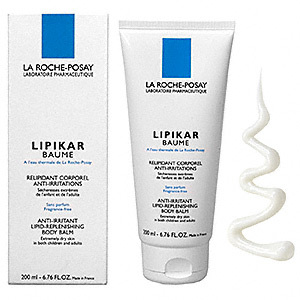 Another product in the Lipikar range from La Roche-Posay's extensive skincare collection aimed at providing the right combination of skincare products for all skin types - including dry/ itchy/ easily irritated skin like mine. I while back I reviewed another product from La Roche-Posay - their Lipikar Surgras Shower Cream. They also sent me the Lipikar Baume AP/ Lipikar Balm AP to try on my sensitive skin. The product is called a balm but I would say it's more like a moisturising cream. It does have quite a different consistency though in that the texture is a little more elastic/ stretchy than a cream. I want to say sticky - but it didn't leave a tacky residue behind or anything like that. Sounds perfect for me! It's suitable for both adults and children. What was the Lipikar Baume like? In terms of the anti-scratch element - I cannot say that it has stopped me itching or that I've had no eczema flare ups since using it, but I didn't really expect this to happen. As the product seems to sit on the surface of your skin more than most I think it minimises the impact of your scratching a little though. Any negatives to Lipikar Baume? I mentioned the different texture to this product earlier - and the main drawback to the Lipikar Baume I would say is that after you've applied it, the surface of your skin can become covered with fabric particles/ fluff from your clothes. I used the Lipikar Balm on my legs this morning and I am wearing a pair of very old black cord jeans (washed many times over). My legs are now covered in a fine layer of black fluff - and it doesn't brush off that easily either. This may or may not be a problem for you but I remember once shaving my legs and then because I used this product my legs gained an instant fuzz as soon as I got dressed! I think that what La Roche-Posay are doing is great. Their Lipikar Balm (unlike the shower cream) has no perfume in and seems to be a highly nourishing skin moisturiser. The fuzzy thing may or may not bother you. It doesn't happen on my face - mainly legs and crooks of arms so it's not too serious. There are further products in the Lipkar range though, such as as an oil and a body milk, that may not have the same sticky factor. I might just give them a go. Hi, I've just come across your blog. Thanks for all the tips, the coconut oil sounds great! Interestingly, I've recently been using this lipikar baume too, but I found it not very effective. I preferred Avene's tolerance range! However, the la roche posay toleriane cleanser is really excellent for removing make up and cleaning the face without use of water. Glad to know someone else out there struggles with eczema too.